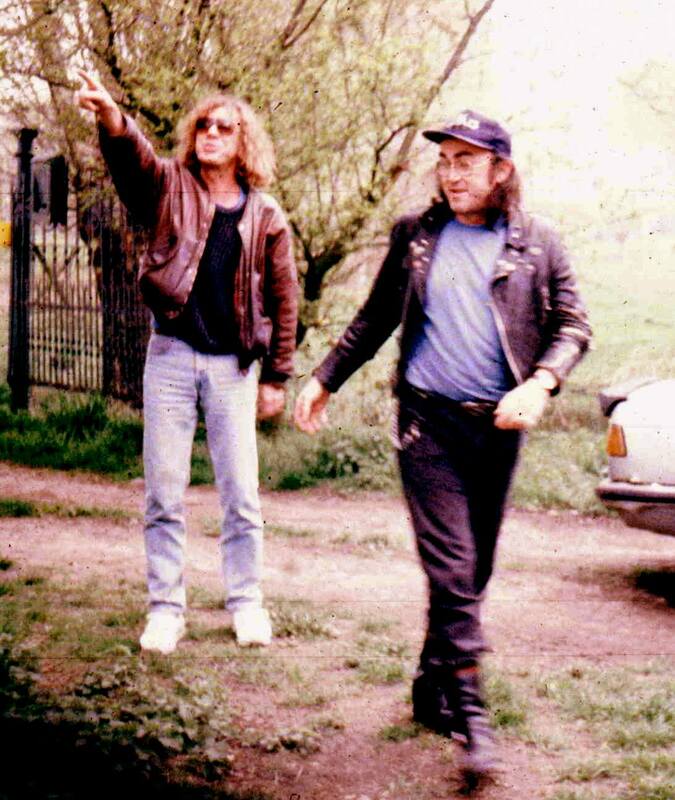 Kevin Ayers and Ollie Hallsall – Thanks to Marvin Siau for this wondeful photo! Kevin Ayers released a stunning volume of work over the years and I am currently putting together a big spreadsheet of all his songs and albums. However progress is slow, so any help would be appreciated! The idea is that you will be able to use this site to cross reference his songs and get familiar with different versions that appeared on different albums, live recordings, compilations and singles. It’s a big task, but I think it will be a good project and hopefully along the way we will get to discover and hear some Kevin Ayers music that we didn’t even know existed. We began writing this blog at the end of July 2013 and shortly afterwards we went to Kevin’s Memorial Event in Deia, Mallorca which was held on the 16th August 2013, which would have been Kevin’s 69th birthday. Susan has written a book about the events leading up to this event and the even itself. It is now available on Amazon. Hi Derek, Nigel doesn’t do the internet, but I can email you his phone number/address if you wish. Could you please send me the link to get the MP3 files. please check your email, you will have a link there. Your site is a welcome surprise! Saw Kevin and the Wizards at a packed Borderline, London 7 June 2003. Excellent gig. Would greatly appreciate any music links you are willing to share. Keep up the good work. Hi Phil, well this site is a ‘work in progress’ but unfortunately ‘real work’ 🙁 gets in the way a bit. It’s happening slowly and we will let you know when we have something worth looking at. Meanwhile, you have the downloads yeah? Hi, this site is great. I listen to Kevin Ayers every day, what an amazing guy, unique and brilliant, not only was his music brilliant but his whole outlook on life was and still is inspiring. Is there some MP3 files I can be sent? Thanks in advance if so. Have a great day, Kim. I saw Kevin Ayers play in Deya at a new museum Bill Waldron built with a little help on the archeology front from me, and later saw him in London at a club I can’t remember. The Soft Machine with Ayers I loved because they had a sense of humor. I heard about his death from Tomas Graves. The crazy thing is, I’ve been trying to get in touch with Nigel Stoneley for the past few years, and stumbled upon your website, and the query for his contacts. He has always been my guardian angel–it’s a long story– and I would love to hear from him. I think he was/is a good poet and made me laugh a lot. Hope someone will please ask him to email me his phone so we can talk a bit. He knew me as Diane Williams, and I am still an American, whatever that means. Sorry if I messed up. Just hope that Rick will kindly ask Nigel Stoneley to contact me at my email or if not email me with his address and phone number. Not sure my first comment got through. Hi Diane, well stumbled upon! Comments have to be approved by us first time to avoid spammers and weirdos! I’ve emailed you some details about Nigel. I’m sure he would love to hear from you. Thanks for sharing your story, Al. 1993 must have been a tough year for Kevin, with the sad passing of Ollie Halsall. Our memorabilia from Richard Derrick gives a good insight into Kevin’s American activities. I discover your blog tonight (from France). Fantastic ! And, of course, your cassette recording of J. Peel (on Youtube, unfortunately, with “holes”….). As you, my life has changed when I heard K. Ayers (but I was 18). To me, the five first albums are the best. Nothing to throw away ! I have the french lp’s. So, if you want the scan of sleeves or labels, they are available. First heard Kevin Ayers in 1970 on John Peel (but of course) – what an eclectic time with Peelie championing the laddish Faces at the same time as the whimsical Toff-like KA. I thought he was like a psychedelic Jake Thackaray, and still do. Never got to see him until 1988 in my home town of Brighton then he made a couple of appearances in 1994 and 1995 at the original Concorde, one on a Saturday and the latter on a Sunday night. Being a Sunday and pre-current licensing laws, an announcement went up at 10.20pm that it was last orders at the bar whereupon our boy asked very drolly if someone could get him a double brandy and coke ( he looked as if he had a few on board already, fine chap). As the band commenced the next number at least four doubles arrived near his feet at the monitors(Gently placed, that is)! He set about supping them at the next break between songs,of course. I came to get into Kevin Ayers by way of Cale/Eno & Nico. From there I picked up Joy of a Toy and the 1st Soft Machine and have been enamored ever since. I wish I could have seen him live. Thankfully he had left behind an impressive catalog to revisit. Currently enjoying th Warner Music Japan SHMCD’s of his back catalog, Harvest records era. They sound fantastic! Highly recommend them. Love the site! I first saw Kevin on the Dr Dream tour at Manchester Free Trade Hall. He had the silver satin suit, played a very tight set and was supported by Ollie who blinded us with his solo on May I? and a remarkable solo on Lady Rachel. I saw him in Manchester a few years later, backed by some of my heroes (Richard McCracken, Rob Townsend) and an unknown guitarist called Andy Summers. But the set was laboured, very ‘going through the motions’. A shame as by then I was a great fan (and still am). A great talent that deserved a greater audience. However, there was a hidden current in that second concert – throughout I unknowingly stood about ten feet from my future wife, although it would be some years before we actually met. So thanks for that, Kevin. What a great pleasure to find your site. I have loved his music since my teens, many years ago, and saw him on a number of occasions, the last being at Sussex University in the mid 80’s. Buying a copy of The Unfairground and finding it to be among his finest albums was one of the most uplifting experiences of my life. Hello! and greetings from Tijuana. Just finished reading your book. I was almost overcome with emotion. The music of Kevin Ayers means a lot to me. I remember reading Eric Burdon’s autobiography; where he visits Deia and hears Ollie Hallsall’s electric guitar blasting through the town one Saturday night. I’m going to look for that book you mention written by a local musician. From time to time we can let you know about any further discoveries we make about Kevin Ayers and his music. Just leave your email here and we will let you know. So far we have the 1976 John Peel Soft Machine special and the 2012 Mr Kyps, Poole, Dorset Bootleg for download. Wonderful stuff – just leave your email here and we will send it over right now. The Last Interview with Kevin?